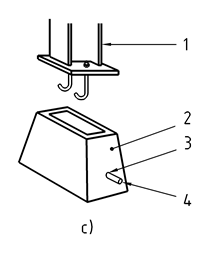 This European Standard deals with the requirements and the basic performance criteria and specifies where applicable minimum values for precast foundation elements (comprising columns with integrated foundation elements, pocket foundation elements, sockets) made of reinforced normal weight concrete for structure of buildings according to EN 1992-1-1. This European Standard covers terminology, performance criteria, tolerances, relevant physical properties and special aspects of transport and erection. This European Standard does not cover the bearing capacity determined by testing. For the purpose of this document, the terms and definitions given in Clause 3 of EN 13369:2004 and the following apply. NOTE It can either be a part of a pocket unit or be cast on site. 4.1 of EN 13369:2004 shall apply except that 4.1.4 is not relevant. 4.2.1 of EN 13369:2004 shall apply. 4.2.2 of EN 13369:2004 shall apply. 4.2.3 of EN 13369:2004 shall apply except that 4.2.3.2 is not relevant. 4.3.1.1 of EN 13369:2004 shall apply. 4.3.1.2 of EN 13369:2004 shall apply. 4.3.2 of EN 13369:2004 shall apply. 4.3.3.1 of EN 13369:2004 shall apply. 4.3.3.2 of EN 13369:2004, 10.9.6 of EN 1992-1-1:2004 and 6 of EN 1997-1:2004 shall apply. Interactions with soil irregularities shall be checked. 10.9.6 of EN 1992-1-1:2004 and Clause 6 of EN 1997-1:2004 shall apply. 4.3.3.3 of EN 13369:2004 shall apply. 4.3.3.5 of EN 13369:2004 shall apply. 4.3.3.6 of EN 13369:2004 shall apply. 4.3.7 of EN 13369:2004 shall apply. 4.3.8 of EN 13369:2004 shall apply. Clause 5 of EN 13369:2004 shall apply. 6.1 of EN 13369:2004 shall apply. 6.2 of EN 13369:2004 shall apply. Previous type tests (or tests) executed before the application of the present standard may be used as type tests provided they are related to the same product family with the same or equivalent or more demanding test method. 6.3 of EN 13369:2004 shall apply. Inspection schemes shall be conducted in an accordance with Annex A of the present standard and EN 13369:2004, Annexes D.1 to D.3, D.4 as amended in Annex A and D.5. Clause 7 of EN 13369:2004 shall apply. NOTE For CE marking see Annex ZA. 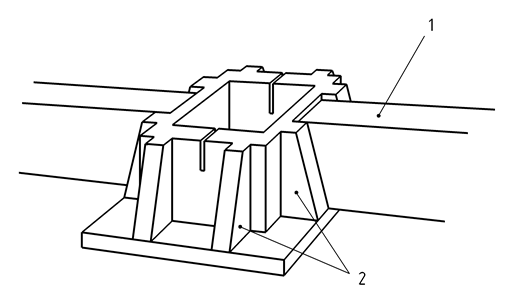 The detailing of the element, referred to geometrical data with the complementary properties of materials and inserts, shall be given in technical documentation, which includes the construction data, such as the dimensions, the tolerances, the layout of reinforcement, the concrete cover, the expected transient and final support conditions and lifting conditions. The composition of technical documentation is given in clause 8 of EN 13369:2004. The Table A.1 replaces item 2 of Table D.4 of EN 13369:2004.
c) columns with integrated foundation elements (see Figure B.5). The producer should choose to apply, for CE marking, one of the methods described in ZA.3, on the basis of the following conditions. — off the shelf and catalogue products. — precast product with product properties declared by the producer. — all other cases than Y.2 and Y.3. This European standard has been prepared under the mandate M/100 "Precast Concrete Products"1 given to CEN by the European Commission and the European Free Trade Association. The clauses of this European standard shown in this Annex meet the requirements of the mandate given under the EU Construction Products Directive (89/106/EEC). Compliance with these clauses confers a presumption of fitness of the foundation elements covered by this annex for the intended uses indicated herein; reference shall be made to the information accompanying the CE marking. WARNING — Other requirements and other EU Directives, not affecting the fitness for intended uses, may be applicable to the foundation elements falling within the scope of this standard. NOTE 1 In addition to any specific clauses relating to dangerous substances contained in this Standard, there may be requirements applicable to the products falling within its scope (e.g. transposed European legislation and national laws, regulations and administrative provisions). In order to meet the provisions of the EU Construction Products Directive, these requirements need also to be complied with, when and where they apply. NOTE 2 An informative database of European and national provisions on dangerous substances is available at the Construction web site on EUROPA (accessed through http://europa.eu). This annex establishes the conditions for CE marking of foundation elements made of reinforced concrete, used for the construction of the structures of buildings and other civil engineering works and shows the relevant clauses applicable. The foundations for bridges are not covered by this standard. This annex has the same scope as Clause 1 of this standard and is defined by Table ZA.1. Method 3 = declaration of compliance with given design specification (see ZA.3.4). The producer shall select when he applies each method in accordance with Annex Y. The requirement on a certain characteristic is not applicable in those Member States (MSs) where there are no regulatory requirements for that characteristic for the intended use of the product. In this case, manufacturers placing their products on the market of these MSs are not obliged to determine nor to declare the performance of their products with regard to this characteristic and the option “No performance determined” (NPD) in the information accompanying the CE marking (see ZA.3) may be used. The NPD option may not be used, however, where the characteristic is subject to a threshold level. System 2+: See Directive 89/106 (CPD) Annex III-2 (ii) First possibility, including certification of the factory production control by a notified body on the basis of initial inspection of factory and of factory production control as well as of continuous surveillance, assessment and approval of factory production control. The attestation of conformity of foundation elements made of reinforced concrete, for the essential characteristics indicated in Table ZA.1, shall be based on the evaluation of conformity procedure indicated in Table ZA.3, resulting from the application of the clauses of this or other European Standards indicated therein. name of, and position held by, the person empowered to sign the declaration on behalf of the manufacturer or his authorised representative. name of, and position held by, the person empowered to sign the certificate. The above mentioned declaration and the certificate shall be presented in the official language or languages of the Member State in which the product is to be used. The manufacturer or his authorised representative established within the EEA is responsible for the affixing of the CE marking. The CE marking symbol to affix shall be in accordance with Directive 93/68/EC and shall be shown on the product (or when not possible it may be on the accompanying label, the packaging or on the accompanied commercial documents e.g. a delivery note). "No performance determined" for characteristics where this is relevant. The "No performance determined" (NPD) option may not be used where the characteristic is subject to a threshold level. Otherwise, the NPD option may be used when and where the characteristic, for a given intended use, is not subject to regulatory requirements in the Member State of destination. The minimum set of information to be put directly in the affixed label or in the companying document is given in Figures ZA.2, ZA.3 and ZA.4. reference to this European Standard. The same identification number shall mark, in the accompanying documents, the information related to the unit. Figure ZA.1 gives the simplified label to affix to the product, containing the minimum set of information. The other information defined in ZA.3.1 and not given with the simplified label shall be provided with the accompanying documents. NOTE For small elements or for product stamping reasons, the size can be reduced by removing reference to EN and/or to FPC certificate. (Method 1 to determine properties relating to essential requirements "mechanical resistance and stability"). 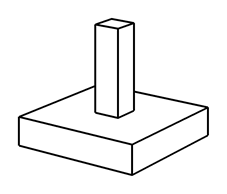 Figure ZA.2 gives, for a type of foundation elements made of reinforced concrete, the model CE marking inclusive of the information needed to determine, according to design regulation valid in the place of use, the properties related to mechanical resistance and stability, including aspects of durability and serviceability. possible reference to Technical Information (product catalogue) for detailing, durability and geometrical data. NOTE 1 Numerical values are only as example. (Method 2 to determine properties relating to essential requirements "mechanical resistance and stability"). For all design data, including models and parameters used in calculation, reference may be made to the technical (design) documentation. possible reference to Technical Documentation for geometrical data, detailing, durability and other NDPs. Figure ZA.3 gives, for reinforced foundation elements made of reinforced concrete, the model CE marking in the case in which the properties related to mechanical resistance are determined by means of EN Eurocodes. 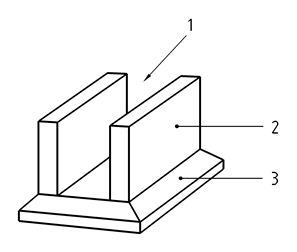 The design values of the mechanical ultimate strength of the element shall be computed using, for the Nationally Determined Parameters, either the values recommended in EN 1992-1-1:2004 or the values given in the national annex of the EN Eurocodes applicable to the works. For geometrical data, detailing, durability, and any complementary information other NDPs see the Technical documentation. 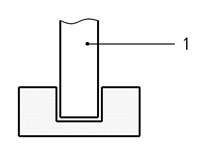 NOTE Mechanical resistance parameters refer to the precast element without any additional cast-in-situ part. (Method 3 to determine properties relating to essential requirements "mechanical resistance and stability"). a) For cases in which a structural component or kit is produced in accordance with the design details (drawings, material specifications etc.) prepared by the designer of the works. b) For cases in which the producer has designed and produced a structural component or kit following the provisions of the client’s order. 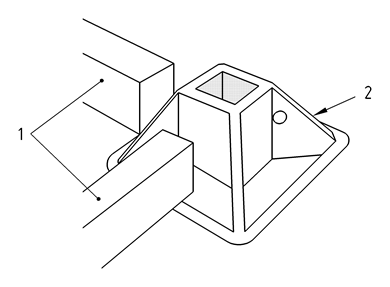 Figure ZA.4 gives, for reinforced foundation elements made of reinforced concrete, the model CE marking in the case the product is produced according to a design specification in which the properties related to mechanical resistance and stability are determined by means of design provisions applicable to the works. tensile yield strength of reinforcing steel. This method applies also in case of a design made with means other than EN Eurocodes. In addition to any specific information relating to dangerous substances, the product should be also accompanied, when and where required and in the appropriate form, by documentation listing any other legislation on dangerous substances for which compliance is claimed, together with any information required by that legislation. NOTE 1 European legislation without national derogations need not be mentioned. NOTE 2 Affixing the CE marking symbol means, if a product is subject to more than one directive that it complies with all applicable directives.